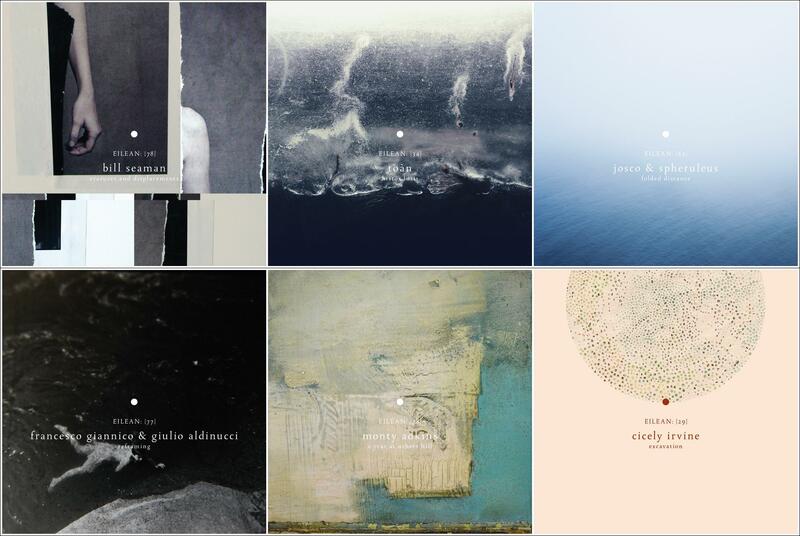 It has been a little while – too long in fact – since we have visited the shores of the Eilean, an imaginary territory the map of which is now dotted & colored by 60 albums covering a broad and eclectic spectrum of ambient, electroacoustic, and modern classical music. The label saw five outstanding releases over the summer months by Bill Seaman, Toàn, Josco & Spheruleus, Francesco Giannico & Giulio Aldinucci, and Monty Adkins and has begun the transition to autumn with an exceptional debut record by Cicely Irvine. Here is a brief synopsis of each along with selected tracks for the reader to explore as well as links to the artists whose work is featured on the covers where available. (Note: most of these limited editions sold out soon after their release, but some may be available in small quantities; check the linked Bandcamp pages for details). The only artist thus far to have two solo releases out on the label, Seaman beguiles once again on his encore to 2015’s excellent F Noir. In calling the new record Erasures and Displacements he offers metaphorical cues suited to the album’s austere, lugubrious vibe while also hinting at the process by which he created it. Sparsely elegant, pensive, and haunted by a slightly ominous sense of unease, Erasures and Displacements, like its predecessor, strikes me as a very nocturnal record – an ideal companion for isolated reflection in the late night hours. Quite generous in length, it is a double CD release featuring artwork by Francisca Pageo. Toàn is a new project from French musician Anthony Elfort which features music composed entirely by samples found on old records, live instruments and field recordings. By choosing not to incorporate any synthesized sounds, he is able to produce highly organic compositions set against an ornately textured backdrop. Rich and immersive from start to finish, Histós Lusis is bookended by arguably its most beautiful tracks – the lush, sweeping “Inland” to open the record and the 12-plus minute “Une Si Délicate Tempête” as the sprawling final coda. In the dedication of the album, Elfort cites the Latin phrase ‘post tenebras spero lucem‘ meaning ‘after darkness I hope for light’, an apt metaphor for the expansive journey this album offers. Histós Lusis is a single limited edition CD release featuring artwork by Valerie Kabis. Having already released a solo album on Eilean in 2015 (‘Peripheres’), Harry Towell returns as Spheruleus in collaborative mode work with Josco, aka Gerard McDermott, an Irish sound artist currently based in Thailand. The album title refers to the traversing and bridging of long geographic & temporal distances as the pair developed these pieces which feature field recordings and track titles taken from Thailand, Turkey, Austria, UK, Ireland and Morocco. The result is both understated and compelling as layers of hushed, translucent drones create a permeable veil behind which lies the narrative in the form of subtle melody lines woven into a mosaic of sonic ephemera rooted in a sense of place. Folded Distance is a single limited edition CD release featuring artwork by Jonathan Smith. Composed, performed, mixed and produced in Italy by Francesco Giannico and Giulio Aldinucci, Reframing reprises a partnership that we first experienced on the 2016 Dronarvim release Agoraphonia. Details are scant on the concepts behind the record but we are not without clues via the titles. Reframing is the act of looking at some situation or problem from a different vantage point, often in a positive way so as to better understand or adapt to it. With track titles such as “Encoding”, “Storage”, and “Retrieval” one might infer the music is parsing our overwhelming and often difficult experience in the digital world and presenting it back to us through a different point of view. Delicately balancing the visceral with the cerebral, these drones are dense but thoughtfully constructed and studded with a plethora of textures to create a pleasantly abrasive effect with a subtle emotive undertow. While that may be a speculative interpretation, one thing is certain – Reframing makes for fascinating listen. The album comes in a single limited edition CD release featuring artwork by artwork by Rebecca Cairns. Monty Adkins is a composer based in remote countryside of the north of England. In the late 2000s he shifted his focus to creating immersive listening experiences working with a reduced sonic palette that draws on elements of ambient, minimal electronica, acousmatic and experimental electronic music. His first release on Eilean entitled A Year at Usher’s Hill presents these elements together combined with his interest in psychogeography (the study of the influence of geographical environment on the mind or on behavior) on a personal level. Adkins weaves a shimmering tapestry using electronics, organ and celesta with embroidered throughout with some lovely piano work by Jonny Best. Adkins’ textural work shines on such delicately constructed tracks as “Radiant Moon” and “Burnt Sun” while Best’s piano is beautifully weighted and quite moving on such melancholic pieces as “In Memoriam Jacques Hamel”, “Before Sleep”, and “Under a Luna Sky”. A Year At Usher’s Hill is definitely one of Eilean’s most beautiful and accessible releases. It comes in a single limited edition CD release featuring artwork by Sam Lock. Excavation by Cicely Irvine is the newest release in this group and the first of Eilean’s autumn 2017 series. It also the artist’s full-length debut featuring music she composed, recorded and mixed between 2010 and 2017 in bedroom studios in Gothenburg and Stockholm, Sweden. Given the span of time it covers one might expect something that sounds more like a compilation than a cohesive album, but that is not the case here. Thanks to thoughtful sequencing and the wide array of instruments used in endlessly in inventive combinations (voice, guitar, bass, piano, pump organ, synthesizer, glockenspiel, musical box, sansula, saw, glass, flute, bells, melodica, and violin) it plays more like a story told in chapters. Settings, scenes and moods change, but it all holds together bound by common motifs and a narrative arc. Delicate and restrained throughout, the central segment of the album is especially lovely, a run of tracks that begins with the warm, melodic tones of “Organ” followed by the acoustic guitar lines of “Takten” and the “The Deer” which adds gossamer layers of vocal & instrumental texture leading into the crystalline beauty of “Genom Skogen”. Excavation is an exceptional debut and an utterly enchanting journey that only grows more inviting with each spin. The album is available in a single limited edition CD release featuring artwork by artwork by Shannon Rankin.